Our Showcase Theme has been entirely rebuilt with a responsive framework, filterable portfolio, retina optimized design, post formats and much more! We have breathed new life in to the theme, with a fresh, modern and minimal new design. The Showcase Theme is an excellent solution for any artist — illustrators, designers, photographers, animators and more! This is another great example of a beautiful theme update from Organic Themes! While most theme shops retire old themes, we revive them! 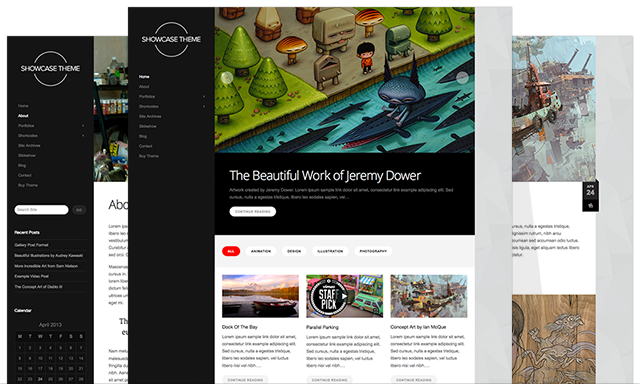 We’re confident the latest version of the Showcase Theme will be among the best WordPress portfolio themes available. Is there a free update for those who have already purchased this theme? Also, do you need to re-upload all the content when upgrading from old showcase to the new one? I am trying to figure out how to populate the homepage portfolio. According to the Showcase Theme Legend, the homepage portfolio can be configured at Appearance > Theme Options > Homepage Settings. I am using the current version of the theme (v3) and there is only settings for the homepage slider on the homepage settings page. There is no mention or ability to set the category for the portfolio. Can you provide any insight into this? Thanks! Please submit a support ticket here for support: http://www.organicthemes.com/support. You will want to start, however, by creating a post within the portfolio post type (the ‘portfolio’ tab). I have a client who is an artist and wants to re-do her site. Can this theme easily be changed to have white color scheme rather than black? Is there a demo of that white look I can show her? It would require editing the stylesheet, but it’s not terrible difficult. No, but I”d like to see what it looks like before I buy. Any way to do that? You could create a mockup, either in Photoshop or with a browser inspect tool. Hi, I just ran an theme check plug in and its came out with a long list of errors- the date now is 22/12/2014 is there a means of updating the theme? It’s not necessary to post the same same in multiple places. Please see your support thread for instructions on updating the theme. The current version has no errors from the Theme Check plugin.